Each spring, St. Ann’s Warehouse presents LABAPALOOZA! 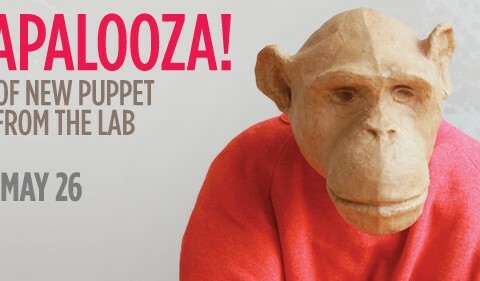 A Festival of New Puppet Theater from The Lab, showcasing the work developed over the year in our PUPPET LAB. Now in its 15th year, the Puppet Lab is St. Ann’s Warehouse’s experimental haven for artists developing interdisciplinary puppet and object theater projects. This year’s festival of their works-in-p­rogress brings you irresistible stories that epitomize the magic of puppetry with tales of sinking ships, monster sightings, dream anthologies and more. A display of puppet models and prototypes from this season’s Puppet Lab participants. A reenactment of the Mothman monster sightings which occurred in Point Pleasant, West Virginia between November 1966 and December 1967. A cranky, Russian conductor peacock is found hiding in exile in London. Forced to recount his past in order to seek asylum, he becomes a “Scheherazade of the visa,” wooing border control officers with his vibrant and operatic history. I came out of a dream, got out of bed and left home. When I walked down the street and turned a corner, I came out of a dream again. Then I got out of bed and left home. A toy theater piece which draws a parallel between the 1819 sinking of the whaling-ship ESSEX by a sperm whale and the dangerous backlash of overtaxing the Earth’s resources. By the light of a buzzing TV, everyday objects come to life. A broken bicycle wheel spins, cardboard boxes hide creatures in the dust, and Christopher pieces together the moment when it all went wrong. A female chimpanzee in a biomedical facility, nearing the end of her life, remembering and coming to terms with her time as a child in a human family.